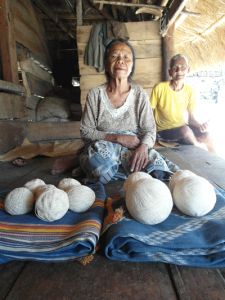 Sumba is well known for its weaving; back in the day, villagers used to wait til the pods of the kapok tree kapas bush burst open to yield their cotton, then patiently spin it in to thread with nothing but a little wooden top (a jenny? am I making that up?) gyrating on a broken plate fragment. It’s rare these days. Trying to follow all the steps involved described by Mama Lakabobo, shown here with a whole year’s production, I could understand why. The older spinners’ place has been taken by little boys with warring spinning tops. The loser of the last round sets his top spinning first. His opponent’s job is to knock the first top off balance, while leaving his own spinning merrily. Witness here the Great Spinning Top Wars of Waikabubak. 3 Comments on "Spinning around Sumba"
Are those the pods? What does a kapok tree look like? A spinning jenny like that can’t possibly manufacture enough to supply a village! Love the pictures! Young spin doctors huh? Hmmmm. Potential competition here.